While you shouldn’t overfeed your rabbits with pellets or treats -- obesity is as much a problem for rabbits as for any other animals -- you should ensure they get an unlimited supply of hay. Not all hays are the same, though. 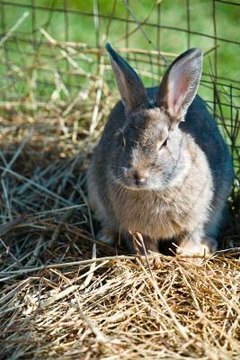 Among those to choose from, timothy and meadow hay are widely available and suitable for most rabbits. Meadow hay is a more generic hay. It consists of a variety of grasses and quite often bits of other plants as well, not to mention sometimes sticks, stones and other random debris. You won’t know exactly what you’re getting, although it is highly unlikely that any of these other bits will be toxic to your pets. Meadow hay usually has the advantages of being cheaper and more widely available than Timothy hay. It provides some variety, although this is not necessarily an advantage, as rabbits often pick out the bits they like, usually the more calorific bits, and leave the rest. This means they can get too many calories and not enough fiber. The upsides of Timothy hay are that you know exactly what you are getting and it makes selective feeding impossible. The other hay you’re most likely to come across is alfalfa hay, not strictly speaking a hay since it is made from dried leaves of the alfalfa plant rather than from grass. It is richer and higher in calories than grass hays. For this reason, while it is a good food for young bunnies, it should not be the main hay for adult rabbits, although it could be a supplemental treat. If your adult rabbits are tending toward the overweight, however, wean them off alfalfa hay entirely. Other grass hays, such as oat hay, are fine, as is fresh grass. Don’t use lawn clippings, which become contaminated from the mower.